Do your holidays seem to always become stressful and full of “wait to the last minute” to do items? If so, then this course is for you! My desire in putting together this course is to provide a tangible way for you to plan out your holidays so they are enjoyable, less stressful, and more filled with the things that really matter. I know that there have been many times that I get in the midst of all the holiday preparations, shopping, gift making, etc., and I lose my focus. I become overwhelmed and forget what Thanksgiving and Christmas are all about. Many of you have enjoyed Marilyn Moll’s (www.MarilynMoll.com) holiday timetable over the years, helping you plan out your holidays. Well, when I saw Marilyn’s timetable I thought it would be great to make some forms for myself to use along with it…creating my own holiday planner. As I began the task of creating all these forms, the Lord prompted me that there may be others who would be blessed by these forms too. So I contacted Marilyn about compiling the timetable and all the forms into a format that I could offer on my website. Marilyn graciously consented and has embarked on this journey with me to provide a very usable and helpful resource for you to use in your own home. begin the first week of October – no more last minute scrambling! give you detailed To Do Lists each week – yes, we tell you exactly what to do each week so you are ready for the holidays! PLUS!!! Two bonus weeks with family tradition ideas, menus, and more! PLUS!!! Some of our favorite holiday recipes! 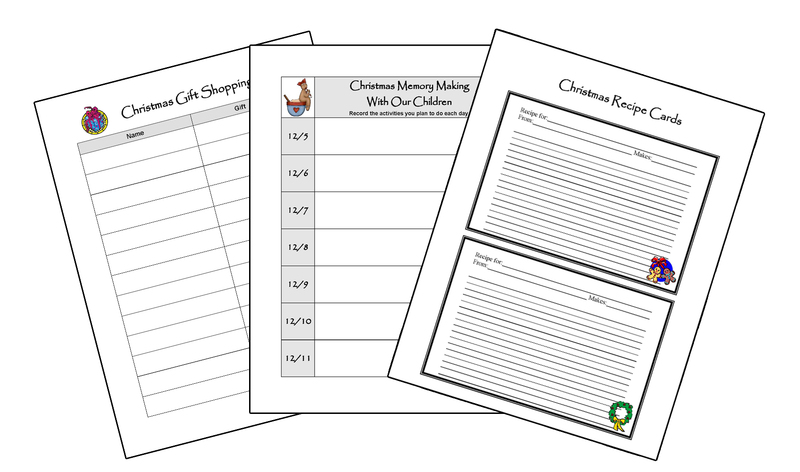 All forms in The Holiday Planner are in editable PDF format! Yes, that’s right! All the forms in the Holiday Planner are editable. If you are not familiar with editable PDF files, you will be able to type into the fields to customize the forms specifically for your family. Once you have them edited as you want, then simply print them, or save them to edit more later. You will LOVE these! We pray they will bless you as our desire is to make this planner very usable and helpful! Buy once, and never buy another holiday planner again! Buy yours today and begin your holiday planning now! Get ready for a more meaningful, organized, Jesus-centered holiday season!